Cabin rental company American Mountain Rentals is still located in Pigeon Forge Tennessee in the heart of the Great Smoky Mountains in Tennessee even though it is now owned and managed by a company based out of town and owned by a foreign company. American Mountain Rentals still have some overnight cabin rentals and chalet rentals most with affordable prices in styles such as honeymoon cabins, family vacation cabins and huge family reunion cabins and for rent near Pigeon Forge, Gatlinburg, Sevierville, and Wears Valley Tennessee. Since they were sold to a foreign company their inventory had immediatly gone from close to 200 rental units down to about 125 cabins and chalets and there are now only less than 90 to choose from with most of the best units long gone. There are nearby attractions in the Smokies and great events in the area - mostly in the summer and fall, just search the web and you will see plenty of beautiful photos of all of the cabins and chalets for rent in the Smoky Mountains. Each cabin has its own rental rates. Many are not only cheap to rent, there are usually never any hidden fees or charges. 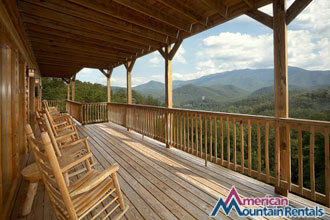 The desirable rental cabins are located near the best locations in the Tennessee Smokies. You can stay right next to Dollywood (here are discount tickets), Splash Country water park (Here are discount tickets) and all the attractions and shopping in Pigeon Forge. Rent a chalet on Ski Mountain in Chalet Village near the Ski Slopes at Ober Gatlinburg and Ripley’s Aquarium of the Smokies (Ripley’s Discount Tickets). There are also log cabins and chalets you can rent from American Mountain Rentals and a few are in beautiful Wears Valley. Some cabins have awesome Smoky Mountain Views and easy access to Townsend Tennessee and Cades Cove in The Great Smoky Mountains National Park. They are also rental units in the old Echota private community less than a mile form the Sevierville Events and Convention Center and a few miles from the Bass Pro Outdoor World Store and the Smokies Stadium. Smoky Mountains Log Cabin rentals with American Mountain Rentals may be luxurious as well as spacious and comfortable along with being very close to Dollywood, Gatlinburg, Pigeon Forge, Wears Valley, Sevierville and the Great Smoky Mountains National Park. The best of the Smokies - right in your own backyard! 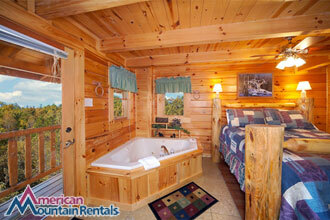 Many Pet Friendly Cabins in the Smokies to Choose from in many great locations! 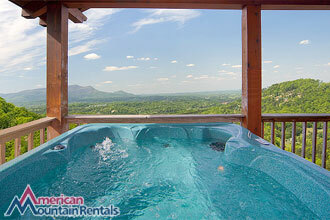 Luxury Cabin Rentals in the Smokies at Cheap Prices year round for you to enjoy! About 130 cheap log cabins for rent in the Smoky Mountains of Tennessee! 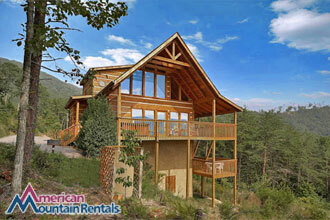 Local cabin rental companies have secluded Smoky Mountain cabin rentals as well as large Family Reunion rental chalets. You can get a discount from the best cabin rental companies in the Smokies in the green box labeled ”discounts to cabins and hotels” below. Choose the cabin rental that is just right for you and book the cabin you want along with complete details about the Smokies and the exact location of a cabin rental for you in Pigeon Forge, Gatlinburg, Sevierville or Wears Valley. Though American Mountain Rentals Cabins and Chalets are all priced cheaper than some companies in the area, your cheap vacation in the Smokies doesn’t have to be a bad one, who wouldn’t want a discount on a cabin rental price? Rent a cabin from American Mountain Rentals or any of the local cabin rental companies and save money rather than eating out and since there is lots to do in and around these vacation homes for rent you won't find yourself pulling out your wallet or purse often at all! Cabin rental discounts and package savings usually cannot be combined with any other offers and may not be valid during holidays or peak rental seasons. For complete details on discounts on cabin rentals in the Smokies check out a rentals companies Special Cabin Rental Discounts Page, or better yet, go to the green box below and grab your own discount from the best rated cabin rental companies in the Smokies.